Ronlyn Domingue is the author of The Chronicle of Secret Riven and The Mapmaker’s War, the first two books of the Keeper of Tales Trilogy. Her critically-acclaimed debut novel, The Mercy of Thin Air, was published in ten languages. Her writing has appeared in New England Review, Clackamas Literary Review, New Delta Review, The Independent (UK), Border Crossing, and Shambhala Sun, as well as on mindful.org, The Nervous Breakdown, and The Weeklings. Connect with her on Facebook, Twitter, and ronlyndomingue.com. I hated history for years. History classes, that is. The endless run of dates and names left me bored, and although I was generally a good student, this was one area where I didn’t do my best. My first semester of college, I gritted my teeth when I sat down in one of the two required history courses I’d have to take. Part I, Western Civilization. Then Dr. Rogers stood at the front of the 300-seat lecture hall. He had a short-cropped beard, unruly brown hair, and rumpled look about his clothes. When he spoke, there was a hint of an accent, one that suggested the British Isles or even an affectation. With fast strokes, he scrawled a few dates and names on the chalkboard, turned to the class, and began to speak. For the next four months, I sat enthralled. Dr. Rogers told stories about people and a world long gone. Stories full of intrigue, humor, and gore. He gave the ancient world context, giving a broader picture of what was happening which, in turn, had an effect on events that unfolded. I studied, a lot. My final grade was an A. But I wasn’t finished with history—or Dr. Rogers. I took an American history class with a professor who was almost as entertaining, and before I knew it, I changed my minor from English (I was a journalism major) to history. I became one of Dr. Rogers’ student groupies. There was a handful of us who took every class he taught, all of which were medieval history courses, his specialty. We were the ones who scrawled notes as fast as he spoke. Our pens streaked across the page as chalk shards flew from his hands when he wrote on the board in fits of excitement. Dr. Rogers was on the periphery of my mind when I wrote an assignment for another college class—a fairy tale about a girl who lived in a kingdom where women were forbidden to read. The girl’s father had a spirit much like Dr. Rogers—exuberant, offbeat, scholarly, serious. I find myself thinking about Dr. Rogers more often these days. As an author, I don’t pattern characters after real people, but it’s inevitable that some of their qualities come through. 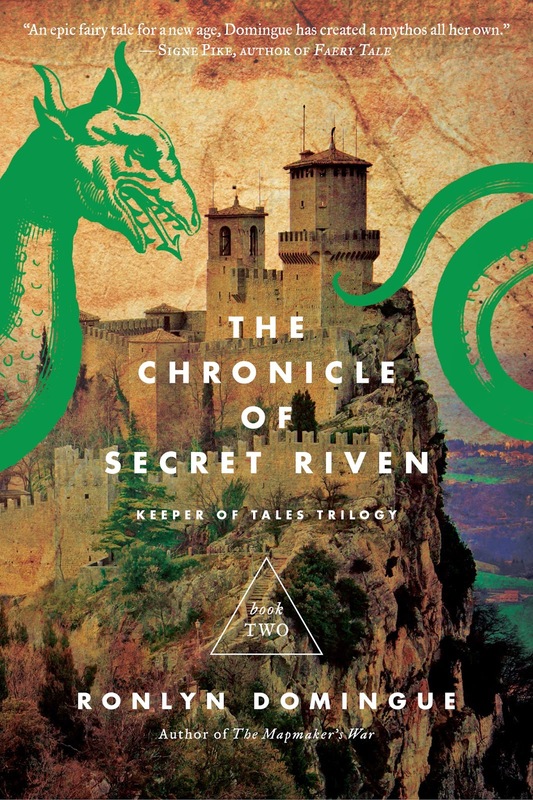 My third novel, The Chronicle of Secret Riven, is far different from the fairy tale I wrote in college, but the character Bren, the girl’s father, survived the transformation. Bren, too, is an historian, who instills a love for stories in his daughter, Secret. And the novel’s world has a hint of the medieval, like a mist from the past. Where Dr. Rogers is now, I don’t know. He left the university not long after I graduated, and I’ve been unable to track him down, not even with the mighty Internet. I think he knew I appreciated him as a teacher, but I never got to thank him. So, Dr. Rogers, thank you for sharing your energy and passion. I have not read The Mapmaker's War, however, I love reading different genres of books. Thanks for sharing. I can relate. When I was a kid, I hated history. Who cared who discovered what and when? When I grew up, I didn't think much about history until I started researching my family history. Then it came alive and I saw these people as real, not just characters in a book. Now, I enjoy reading historical novels and writing them. Congratulations on your book. It sounds intriguing. Thank you, Beverly! Family history IS history. So glad you're enjoying your search. I haven't gotten to it yet, but it looks great. Thanks. I can't wait to purchase both in the series (on payday) at the same time. It's going to be great being able to Dive right in w/o waiting & wondering what happens next! Just reading the reviews right now is a thrill! LOL. No I haven't read it yet but I'm adding it to my ever growing tbr list. I have yet to read The Mapmaker's War, tho it is in my TBR!!!! I've not yet read THE MAPMAKER'S WAR but have placed it and the title featured here on my TBR. Would love to read them back to back!